We are happy to announce a new minor release of Scheduler. Even though it is called a minor release according to the semantic versioning scheme – this release contains new great features, cool demos and lots of bug fixes. This blog post walks you through the bigger changes, for full details please see the changelog. While not yet part of the core, we have added a new demo showing how to export Scheduler data to Excel. It uses a custom fork of the lightweight zipcelx library. Please try the demo here. 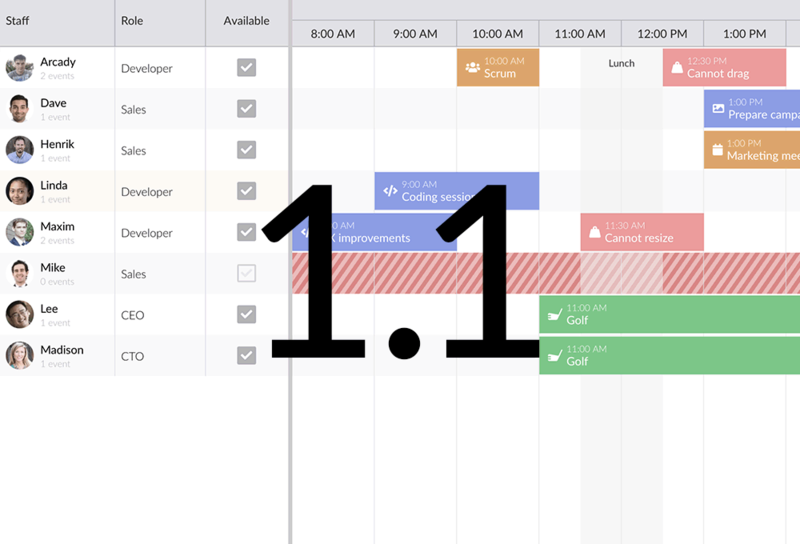 We also recommend you to read the blog post about the Grid 1.1 changes, as they also apply to the Scheduler. Especially the removal of moment.js might affect your date handling. If you encounter anything strange related to this, please report it on our forum. For full details on what changed please see the changelog.